And it’s also taking businesses a record amount of time to fill these openings. US businesses took an average of 29.3 working days to fill a job opening in April, according to DHI Group’s DHI-DFH Mean Vacancy Duration measure. That’s an all-time high, and a solid uptick from March’s revised 27.7 days. DHI bases the number on data from the the BLS’s Job Openings & Labour Turnover Survey (JOLTS). A job is considered to be filled when someone accepts an offer to take an open position. 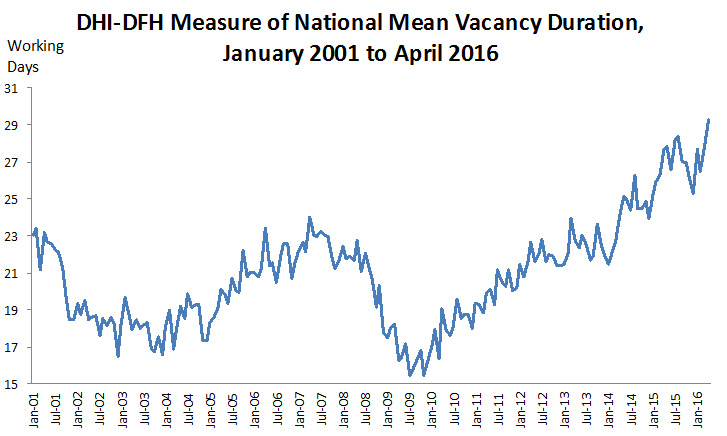 Generally speaking, economists argue that longer vacancy durations combined with falling unemployment rates suggests that the labour market is tightening. However, alternatively, it could also be that there’s a mismatch between employees’ skills and what employers are looking for — which is bad for both parties. 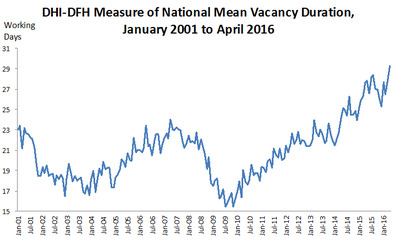 “Vacancy durations continue to lengthen in 2016, despite other indications that labour market tightness has plateaued in recent months,” said Dr. Steven Davis, William H. Abbott Professor of International Business and Economics at the University of Chicago Booth School of Business.